Trying to find the best quality wood to use for your outdoor deck can be difficult since there are so many different options. You need something that will last through the bugs, stormy weather and harsh sunlight for years to come. 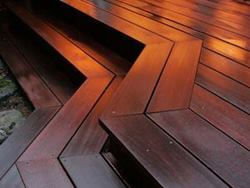 By choosing an exotic hardwood decking, you are investing into the future of your home. Exotic hardwoods are easy to maintain and are a cost effective way to spice up your deck’s look. They are naturally resistant to insect, decay and mold so you can rest assured that it will last decades in the outdoors. Almost all types are suitable for just about any climate from extremely dry to overly humid. Even extremely wet climates are no match for this type of material. All exotic hardwoods boasts rich and vibrant hues that will make any deck look elegant. They come in a variety of colors and textures so you can choose which style best complements your home. Each type of lumber varies in grain size and color so there is sure to be a style that will match your tastes. Exotic hardwoods last longer than softwoods with lifespans as much as 50 years. The cost is comparable to most redwoods or clear grade cedar, however the softwood types of lumber only last half as long as exotic hardwoods. It is easy to maintain your deck when you use this type of wood. To keep your deck looking superior, seal it with Messmer’s UV Plus oil-based stain every year. If you choose to not seal your deck the wood will weather itself into a beautiful silver patina. Exotic hardwoods not only look great but they are meant to last. You can rest assured that if you use them for your deck, you will have a gorgeous and strong structure that will last many years. Visit the hardwood products page for more information on premium hardwoods.